TAWI ATAIR, Oman: Several thousand feet up on a jagged escarpment overlooking the Arabian Sea, Hadi Al Hikmani has come searching for a shy and reclusive creature. The Arabian leopard, the last remaining big cat in the Middle East, is almost invisible in the canyons and dry riverbeds of Oman. So even a growl or a scratch mark would satisfy the conservationist. But Al Hikmani looks set to go home empty-handed as he has so many times after his treks across the Dhofar mountains in the Jebel Samhan Nature Reserve of southern Oman. “Here we go!” yells Al Hikmani as he comes upon a pile of leopard droppings that appears several weeks old. He and a colleague bag the waste, which later will be genetically analyzed to help determine the leopard population in the area as well as the prey. This leopard seemed to have a taste for porcupines, small rodents and hyrax, a plump, rock-dwelling mammal. A few hundred feet up the path, further good news. One of the more than 25 camera traps that dot these mountains caught an image of a leopard - its pale coat dotted with black rosettes and spots standing out against the darkness. It was just a bit larger than a golden retriever and was the first one caught on camera for several months. For conservationists, these are small victories in the race to save a species. Once thriving across the Middle East, the Arabian Leopard is now considered critically endangered by the International Union for Conservation of Nature. It estimates there are fewer than 200 in the wild with the largest single population of 50 to 100 in the mountains of southern Oman. There also are small populations in Yemen and Israel’s Negev desert. The animals’ range is increasingly fragmented by development, overgrazing and herders who shoot or poison them lest they prey on their goats, cows and camels. Leopards in Yemen are under threat from poachers who supply a vibrant exotic animal trade. “They are at a critical point,” said Andrew Spalton, a Briton who advises the Oman government on environmental affairs and has worked on leopard conservation for 16 years. “Inevitably, they are going down. That’s because of loss of habitat. Where they are hanging on are areas that people find most difficult to get into with their livestock and their four-by-fours,” Spalton said. The immediate challenge is to count them and and figure out their gender ratio. “The official estimate given is there may be 200 Arabian leopards left between Oman and Yemen (at opposite ends of the Arabian peninsula). It’s probably half that number and may even be lower. We don’t know,” said Tessa McGregor, a British conservation biologist. McGregor is working with Al Hikmani on a five-year project supported by the nonprofit Earthwatch Institute and the Omani government to gather data on the leopards in Jebel Semhan, train Omani scientists and raise awareness of leopards in communities and schools. But Al Hikmani and others know that research alone won’t save the leopard, and are exasperated that their work isn’t matched by stronger action on the ground. Nothing has been done to combat the rampant overgrazing by livestock that denudes the Dhofar mountains, and enforcement of Oman’s laws protecting leopards is weak. The Jebel Samhan reserve - established in 1997 and also home to striped hyenas, caracal, wolves and many rare bird species - is a park in name only. The 50 rangers only patrol its edges, no tourist infrastructure exists and there isn’t even an entrance gate. The hope is that next month’s Oman-sponsored conference on the leopard will result in more coordinated approach to saving the leopards. The gathering of Omani officials will weigh such proposals as compensating herders for reducing their herds and curbing unchecked development in the area. One option not on the table will be to reintroduce leopards into Oman from the more than 80 captive-bred leopards in nine locations on the peninsula. At the Breeding Centre for Endangered Arabian Wildlife in the emirate of Sharjah, UAE, the leopards are caged and almost docile when humans approach, and they would make easy pickings in the wild. There would have to be protective measures, and animals would have to meet genetic criteria and be trained to hunt and survive in the wild. 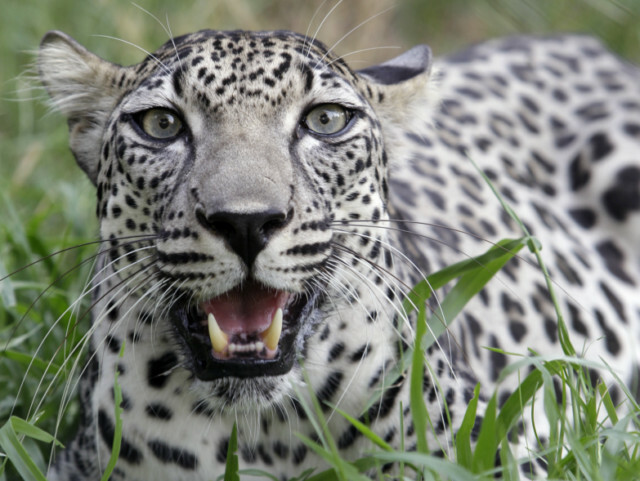 Jane Budd, a South African who heads the Feline Department at the breeding center and is the International Studbook Keeper for Arabian leopards, said she finds herself having to repeatedly explain that releasing captive leopards is not an easy answer. The hurdles to reintroduction were evident on a drive in and around Jebel Semhan with Al Hikmani. Illegal settlements are proliferating in the park and herders allow their camels and goats to roam. New tracks open up almost weekly in the mountains for herders to transport their animals, which means more incentive to treat leopards as a threat. Hadi Al Hikmani grew up in a family of camel herders in the area and joined Spalton as a volunteer when he was a teenager. He works tirelessly to convince his friends and neighbors that leopards rarely kill their livestock and could be huge tourist draw. But on an overnight stay with his father’s herd of 200 camels on a grassy hillside, the affable Al Hikmani was inundated with stories of camels killed by leopards. No one seemed to buy the fact the leopards should remain in the wild. Put them in the zoo, everyone said.